Your tatted egg is perfect for an 'egg doll'. And that CCN pattern looks like it will be a fun stitch. Oh que c'est minutieux et très joli!!! Pour le Neddelwork shop, je ne l'ai pas encore celui là! Et pour le Embroidery Guild, si tu veux, je t'attends? Très jolie travail, quelle finesse !!! 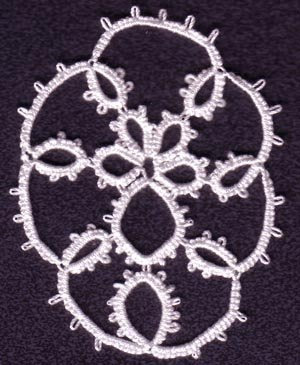 Your tatting is lovely, and you got a nice start on the stitching shop, that pattern is on my wish list. Tatted Easter egg is really nice.